Remember that David Foster Wallace story “the Depressed Person” — controversial (it elicited many angry letters in Harper’s when first published) because it seemed so unsympathetic to the “depressed person” of the title, a woman whose evenings were organized around phone calls to those dwindling numbers of old friends who were still willing to listen to her endless self-pitying monologues? (Of course the irony is that we now realize that this may have been a self-portrait on DFW’s part — at the least, the portrayal came from “inside” depression). 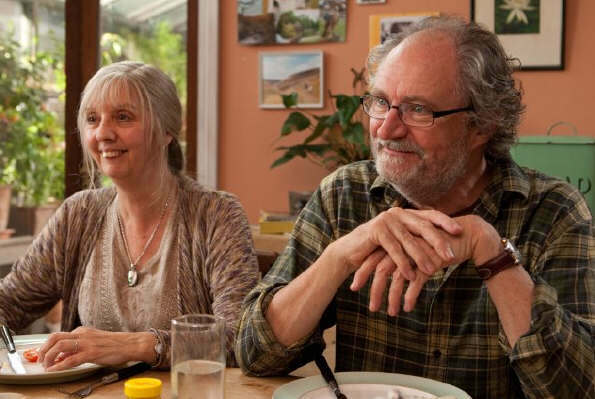 Mike’s Leigh’s Another Year made me think of the story, simply in that it is in part a portrait of depression. 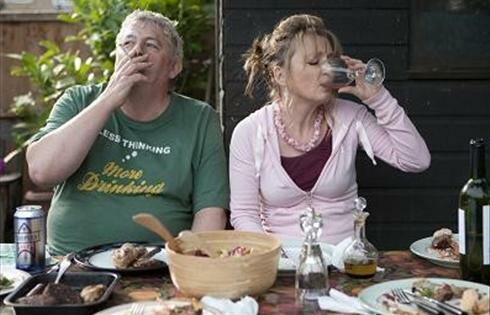 The movie focuses on the lives of Jerry and Tom, a 60-something social worker/counselor and geological engineer couple who share a comfortable, happy life revolving around their fulfilling jobs, home, their gardening in the nearby “allotment” (public garden), and time with their 30-y.o. son and old friends. It’s structured around a year, the “another year” of the title, divided into four seasonal breaks, each with somewhat different cinematography and mood — this organization indebted to Ozu’s seasonal movies, perhaps? Also reminded me of Rohmer. As the movie develops, however, it becomes increasingly dominated by the tour de force performance of Leslie Manville as Mary, Jerry’s longtime coworker and their Depressed Friend. Mary initially seems like a charming, effervescent mess who is clearly not altogether happy but still bubbles over with energy and emotion. A few drinks in, though, and she starts to fall apart into self-pity about how badly she feels her life has gone, how stuck she feels, how unrewarded. The movie actually begins with Jerry talking with a deeply depressed patient who has no will to try to improve her life — we never see the patient again, but Mary reenacts that scene in various ways, such that it becomes clear that Jerry’s friendship with Mary is difficult to separate from her profession as a care-giver and counselor. The movie is all about care-giving — its meaning, limits, dilemmas. How much care can Jerry be expected to offer her depressed friend? I also thought of it as being about different concepts of “wealth.” Tom and Jerry are so “rich” — they are financially comfortable and own their lovely home, but more than this, the movie emphasizes their possession of an extravagance of different kinds of emotional & psychological capital. They have so much happiness and comfort that they can afford to be generous with it. Mary seems poverty-stricken next to them in her loneliness, desperation, self-involvement, inability to control her own emotions and moods. The movie could be criticized for being very “bourgeois” in the link it implies between financial and emotional assets — when you consider, for example, Mary’s pathetically mis-firing dream of owning her own car, which turns out to be a used lemon that she can’t manage to maintain and eventually loses — by contrast, we see Tom and Jerry loading gardening supplies and vegetables in and out of their solid Subaru (I think? )– just one example of the way Mary’s unhappiness and T&J’s happiness are manifest in material possessions. Mary is always dying to spend time in her friends’ home (this becomes a problem later when she starts showing up uninvited), and you can see why — Tom and Jerry’s own happiness and comfort are palpable in their home, and it’s easy to visualize Mary’s cheap, small rental apartment about which she complains bitterly. It’s not simply a matter of ownership or money, however: part of the reason Jerry and Tom can have a nice house and nice car is presumably that they are on an even keel emotionally, are able to follow through on their plans, and don’t fall into bad financial decisions due to personal freakout or crisis. That is to say, their emotional and financial “good health” are reinforcing and create a virtuous feedback loop (and precisely the opposite with Mary). Here are Mary and Ken. The depressed are all big drinker and smokers here. Another potentially off-putting detail: the depressed people seem cut off from child-rearing and from any fully adult relationship to children and childhood. Neither Ken nor Mary have kids. Mary lights up a cigarette right next to a new mother holding her infant, who moves across the garden; Ken joins Mary for this little bitter gathering of the toxic. And Mary comes on in a creepy way to Jerry and Tom’s adult son, whom she at once wants to see (in her nostalgia) as still a child but also as a love object. I watched the DVD track of Leigh’s own commentary. He mentioned that the film is partly about the link between happiness and simple luck — Jerry and Tom’s good fortune at having things work out so well. (Although as a friend commented to me, that luck is also linked to character; it’s difficult to imagine either Tom or Jerry having turned into Ken or Mary even if their life had taken wrong turns.) Like Leigh’s last film Happy Go Lucky, this one is an exploration of happiness — a difficult quality to capture on film; it can seem “unnarratable” as per the famous Tolstoy line about happy families all being alike whereas every unhappy family is unhappy “in its own way.” This view suggests that narrative itself or an interesting story requires unhappiness to break up the sameness of happiness. Whereas Leigh seems to be suggesting that it’s in fact unhappiness and depression that approach unnarratability in their routine, redundancy, circular unprogressive movements. Leigh emphatically rejects as flat-out wrong those who interpret the movie’s final scenes as implying a critique of Jerry and Tom. At this point in the movie Mary shows up uninvited at just the wrong moment, and Jerry especially is, initially, quite cold and critical of Mary: the seemingly never-ending flow of care-giving gets abruptly turned off. Leigh seemed a bit defensive — he spent some time explaining why Jerry’s reaction was absolutely reasonable and that to see the film as criticizing her or portraying her as smug or hypocritical is off base. I actually agree with Leigh… Well, obviously he can’t be wrong about his intentions, but beyond that, I agree that given the circumstances and how narcissistic Mary’s behavior is, it seems wrong to demand of Jerry that she suppress any displeasure at having her small family gathering gate-crashed by her impossible friend. It is interesting, however, to realize how fully Leigh seems to identify with the bourgeois worldview of his protagonists — I do think that the Leigh of 20-25 years ago (of his early films like Abigail’s Party, Bleak Moments, etc) would likely have identified more with the depressed outsiders and been quicker to look for complacency and hypocrisy among his more privileged & comfortable characters. Just to be clear, I loved the movie (Leigh is my favorite current director; here as it usually the case, his unusual film-making methods lead to incredible performances from the actors) & don’t intend this as a criticism. And I think the film is very humane and sympathetic to Mary. But, I think this is a film that might look very different from different audience perspectives — e.g. for someone who identifies more with the life path of Mary (or Ken) than with the happy protagonists’. Thanks Adam, I appreciate it, always delighted if anything here is useful or thought-provoking to someone!